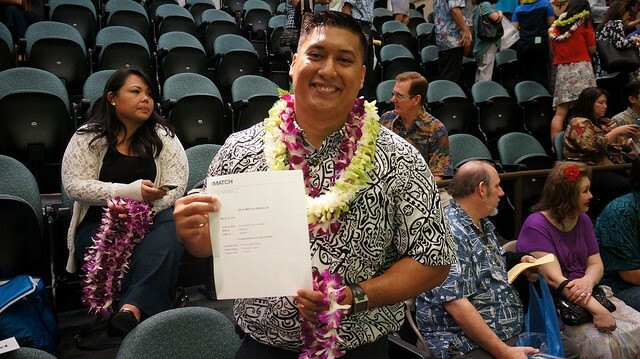 All 66 of the MD students in the Class of 2015 at the University of Hawai`i John A. Burns School of Medicine (JABSOM) are competent enough to proceed into post-graduate medical education programs, or Residency Training, upon graduation in May. They learned today where they will spend the next two to eight years of their lives by opening envelopes containing the confirmation of which program where they will begin their careers as MDs while under supervision of expert faculty. The “Match” of graduating MD to Residency Program is something the students have worked months for, traveling all over the country to interview at programs, and forming a list of their top three choices. For those choosing among the 17 Graduate Medical Education specialties offered in Hawai`i, the difficulty of prepping for interviews was no less grueling. A computer, overseen by the National Resident Matching Program, does linking of hopeful applicant with the institution that accepted him or her. Thirty-five men and 31 women are in the JABSOM Fourth-year Class, where our total MD Student Body numbers 264. 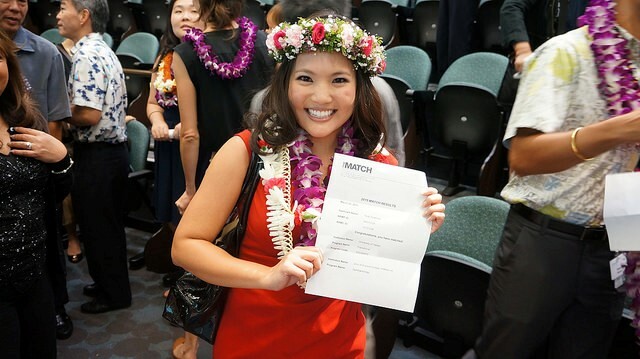 The Class of 2015 matched into programs in states that include: Hawai`i, California, New York, Texas, Massachusetts, Washington State, Arizona, Illinois and Minnesota. In this year in which U.S. News & World Report named JABSOM the #19 school in the country for its Primary Care program, 58% of class matched into the Primary Care fields which include Internal Medicine, Pediatrics, Family Medicine, OB/GYN; and Emergency Medicine, and Geriatric Medicine. The Class of 2015 will be training on the job in Internal Medicine, Family Medicine, Obstetrics & Gynecology (OB-GYN), Pediatrics, General Surgery, Orthopedic Surgery, Plastic Surgery, Neurosurgery, Vascular Surgery, Emergency Medicine, Anesthesiology, Dermatology, Radiology, Physical Medicine and Rehabilitation, Pediatric Neurology, Pathology, Psychiatry and Transitional Year, a one-year program which prepares them for Ophthalmology, among other specialties.